Much like their San Francisco peers (Tuxedomoon, Flipper) sci-fi influenced Chrome were intent on doing things their way. While technically they can be defined as one pre-industrial bands (along with the likes of Throbbing Gristle and SPK), they still stood apart from the whole scene through their use of TV samples and bizarre lyrics. They were also heavily influenced by a number of punk/metal and psychedelic bands, including Stooges, Can, Black Sabbath and Hawkwind. They formed in San Francisco in 1977, with the band’s core centered around vocalist Damon Edge and guitarist Helios Creed, who, in the beginning, were assisted by John Lambdin and Garry Spain and later by a rhytm section of Hilary and John Stench. 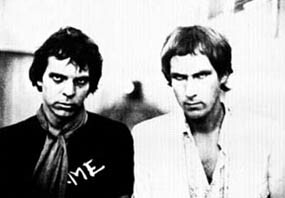 Their first album – 1977 “Visitations” – was just a taste of things to come, although it hinted at bands obsession with science fiction. One of the reviewers described it as “Brian Eno meets Santana”. 1979 “Alien Soundtracks”, their second full-length, along with “Half Machine Lip Moves” (which came out during the same year) are considered to be two classic Chrome albums, as the band started to get rid of pop elements and focus on experimental effects/drones/samples. By the time of release of “Half Machine Lip Moves”, however, Lambdin and Spain were no longer members of Chrome and their contributions to a band’s work were minimal. By the time of their third album release – 1980 “Red Exposure” – Chrome signed to a Beggars Banquet/WEA, major label, but since it was an unsuccesful release, they signed to Dossiers during the next year and produced “Blood On The Moon”, which proved to be their best effort. Their final album was 1982 “3rd From The Sun”, by which time the band broke up, although Edge continued to use the name Chrome until his death in 1995. 1982 also saw the release of Chrome Box, a compilation, which included “Alien Soundtracks”, “Half Machine Lip Moves”, “Blood On The Moon” and “No Humans Allowed”. “No Humans Allowed” was also released separately and included “Inworlds” and “Read Only Memory” EPs. Helios Creed started a solo career in the mid 80s and put out a whole number of records on such labels as Amphetamine Reptile, Cleopatra, and Subterranean. After Edge’s death in the summer of 1995, he picked up a name Chrome and started releasing new material – although both Edge-only/Creed-only material is viewed with suspicion by fans. Chrome’s influence can be heard in work of numerous bands – they were covered by Prong and Jesus Lizard, while Minneapolis band Hammerhead demonstrated Chrome/sci-fi influence via “Into The Vortex” and “Duh, The Big City” LPs.